As we continue each day led by the Lords Spirit, challenges arise to make our journey difficult. We are tested on all sides some days, and it takes all we have to maintain our focus on the Lord. He Has Not forgotten us, not hardly...We Have to Remember to stay focused on Him. Jesus said this would not be an easy Way to Travel...And that He Is With us. As long as we Remember that though we are Waiting on Him, though we Know and Believe the Lord is with us, And is guiding us along the Path that He Planned for us to walk and live on.....We will not succumb to the fleshy, emotional and easy ways of the enemy or of this world. I know for myself, it is hard at times when I am following Him and He Is my Center and my Guide, and I am Patiently and Faithfully Waiting on Him, And everyone else involved Is Not abiding, not leaning on nor are they trusting in the Lord. They may not even belong to Him...That is a challenge for me. When others are governed by their flesh, their emotions, their past, their pain and hurt, their manipulative ways....they have put their self worth, their value, and their life in the hands of their pride, their ego, their lies....It Is a Challenge day after day to stay focused on my Lord when faced with the ego and pride of others. Lord Jesus! But the Spirit of the Lord Reminded me today, that I am not leaning on my own understanding, on my own wisdom, on my own human power and knowledge...And I said to myself...Lord Jesus.. Thank YOU for Reminding me, that I am doing Your Work, And that YOU are Quite Aware of what is going on, You are aware of the hindrances in my way, And that I Know As Long as I stay prayerful, faithful, and completely trusting on You---My Spiritual Eyes and Ears Shall Stay open to See All of what You want me to do...And how to do it! Amen. So that I am not lost in chaos, and emotions. Yes LORD! I am In Agreement with you, that All This Shall soon pass And I will be the better for it and I will learn what I need to learn from it. And that from this preparation I will be more than ready when the next set of challenges rise up to meet me, In the name of Jesus Amen! 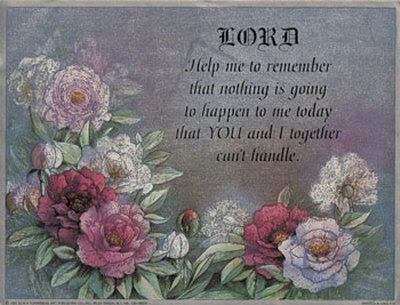 I Hope that this message of Encouragement Will Also Help you today and the next day and the next day And so forth. I have to remind myself to move my Self out of Your Way Lord. I have to Remember to Continue to Take Courage and Lean on Your Strength my Lord. Allowing Your Love so that I continue to be Patient and Trusting You my Lord to Lead, Guide, Direct, Supply and Protect me at this time And All times. I Speak the Truth from my heart, that I will NOT despair or focus on the situation or my emotions. Neither can they govern me unless I allow them to. My Life is in Your hands my Lord Jesus, not in the hands of Fate, nor the enemy, nor other people! I Know I do Not have what it takes by myself to deal with my current or any future challenges--But, I Remind myself that I Am focused on You my Lord, I Do Have Everything that I need, Through You! I Come to you Father in the name of Jesus, my Friend to Thank You for Your Continued Spiritual & natural provisions concerning every areas of my life; growth, maturity, understanding, wisdom, knowledge and courage to name a few areas That I Need you to help me with! I remind You Father, my Mother God, that in the name of Jesus, I NEED YOU Every Day All day for my lifetime! I Know and fully believe that this Too Shall Pass! And Glory is Yours through my life Lord. You Have Given me a Renewed Focus, and Clarity which comes forth into me like the rays of sunshine that awaken Each New Day! Your Purpose Is my purpose, Your Will is my will, In the name of Jesus I praise You and I am grateful to You my God! 2Looking away [from all that will distract] to Jesus, Who is the Leader and the Source of our faith [giving the first incentive for our belief] and is also its Finisher [bringing it to maturity and perfection]. He, for the joy [of obtaining the prize] that was set before Him, endured the cross, despising and ignoring the shame, and is now seated at the right hand of the throne of God."